The full title "This Town: Two Parties and a Funeral-Plus, Plenty of Valet Parking!-in America's Gilded Capital" seems a bit long, but the parties and funerals are an essential part of it while valet parking is somewhat underrepresented. Nevermind! I stumbled upon this book by random chance. I was reading a review in the German newspaper "Die Welt". Neither is that the usual place for me to look for new literature nor is U.S. politics my favorite reading stuff. But serendipity was working hard and overtime that day. 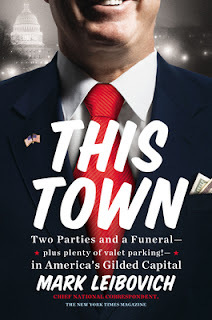 If you want to understand why Washington is headed for self destruction and confirm or exceed all your prejudices about politicians, their always-busy staff, reporter and lobbyists (there are some problems distinguishing those groups), this is the book to read. If it weren't written with such a large amount of self-deprecating humor, i guess it would become completely unreadable for the U.S. electorate due to the pain felt. But when using your Kindle to read through it, you will be tempted to mark every second sentence of the first chapters for further quotation. You may even find quotes about quoting since the later has been elevated to an art form in This Town. Leibovich is an insider, he is part of the system he dissects. Running full disclosure, he points out all his friends he mentions in his book. "Friends" seems to be a Washingtonian slang for "Someone i like sufficiently that even though i would ruin his current career in heartbeat if it were to my advantage, i would later still visit his funeral." Career finishing is not as bad as it sounds. It happens a lot in This Town. But thanks to the invention of the revolving door and the skillful discovery of ones newfound faith in god, you get over it fast. In fact, one may profit so much financially from a downfall, that the urge to leak ones own dirt may become overwhelming. In the end, you will come to understand and even to sympathize with the contempt the Tea Party has for the Washington system and their desire to burn it down. But by reading you will also recognize the futility of their attempts. They will not become part of the system they are fighting, they already are. They step through the same revolving doors as all the other, visit the same parties and on their funerals their death will be mourned by "friends" (see definition above). If you are, as i did, reading this book as a foreigner and feel some Schadenfreude coming up, i recommend to choke it immediately. Much too soon you will recognize the drain our own politics are looking longingly to go down through. Working at front lines of the IT and having fun there. Been around the Internet since 1992 and still in awe what has become of that little baby. Everything i write, post, tweet, blog or blurp is just my personal opinion and is not the opinion or policy of my employer, my cat or my goldfish. (C) Martin Seeger. Picture Window theme. Powered by Blogger.